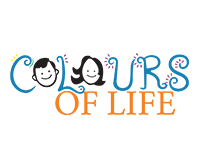 Embassy is in the business of enhancing lifespaces and enriching lives. 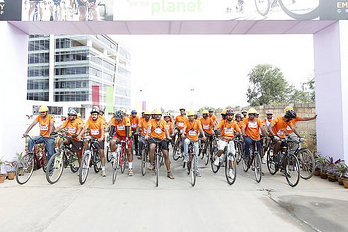 In line with this mission is our commitment to sustainability and green living. We are cognizant of the global need to impede the deleterious effects of climate change, and so all our ongoing and future projects are specifically designed to have sustainability features that have a minimal impact on the environment. Embassy’s projects are designed for LEED certification and our ongoing and future residential projects are designed to obtain an IGBC Green Homes gold or platinum in our efforts to create sustainable developments. Spread across 65 acres of prime land, located off the Intermediate Ring Road, Embassy GolfLinks is one of the flagship office parks with 4.5 million Sq. Ft. of fully developed office space. 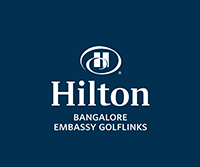 Bounded by a golf course and open parkland, the office park has 21 office buildings, 2 retail blocks and is home to Bangalore’s first Hilton Bangalore Embassy GolfLinks. 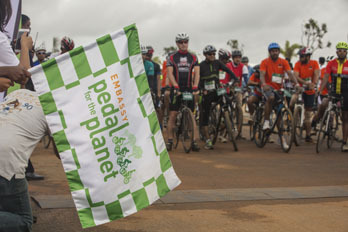 The Pedal For The Planet race will start and finish inside the Embassy GolfLinks but will also take participants through the surrounding areas. 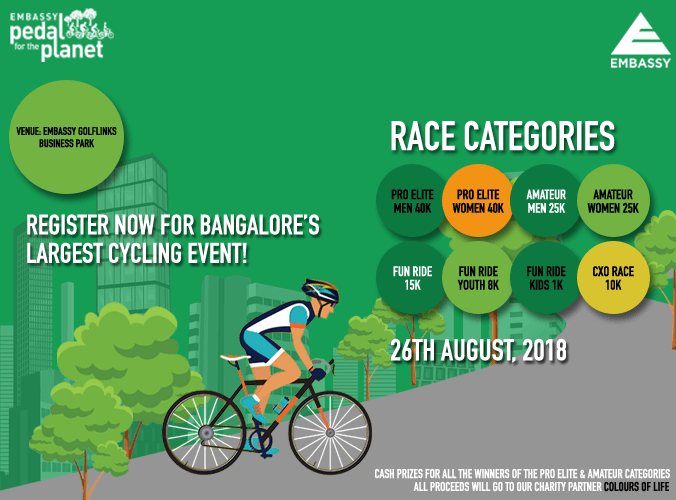 The event is open to participation for the public, who are passionate about cycling and exploring ways to protect the environment. 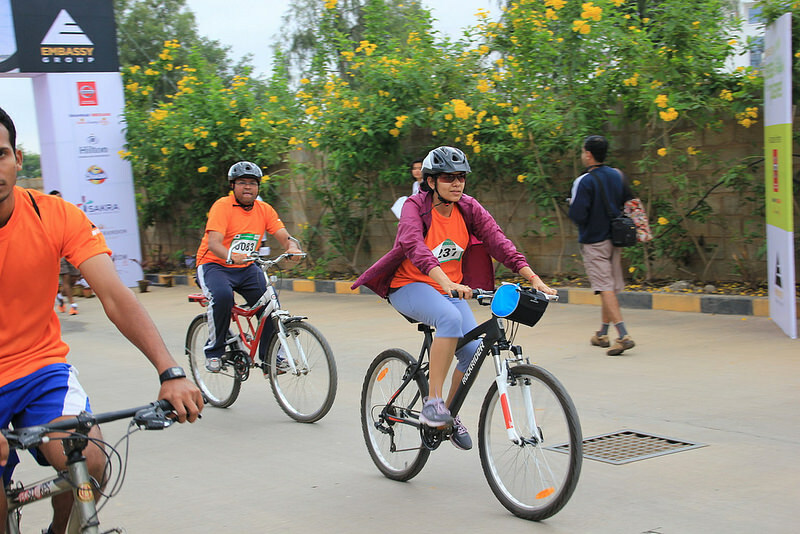 All participants must wear relevant head gear for each leg of the race i.e., Bike Helmet or will not be allowed to compete in the Pedal For the Planet 2018. 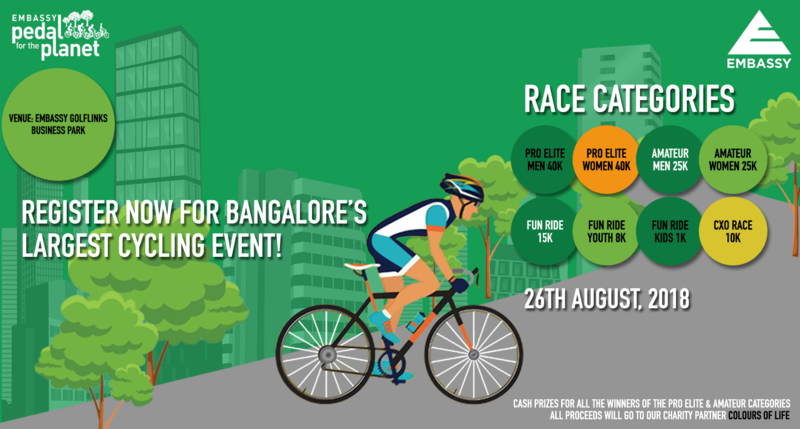 All riders participating in racing will mandatorily have to register. 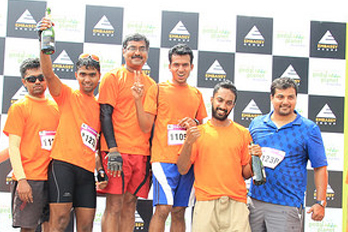 Only those participants who complete all loops / entire race shall be eligible for race prizes. 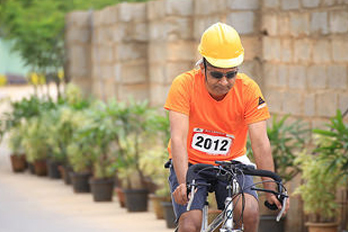 Any participant found to be riding dangerously or found to be violating safety etiquettes of racing shall be disqualified forthwith unconditionally. There shall be ambulances stationed during the race. The organisers will not be liable for the damages of what so ever nature. 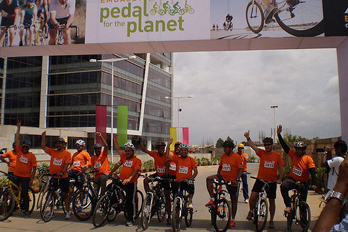 No participant at any time during the race is allowed to ride in the opposite direction of the race route. 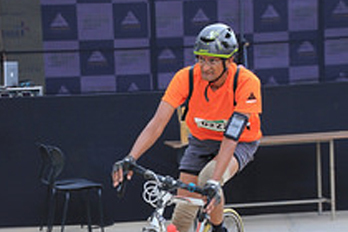 Any rider found without his bicycle during any time of the race will be disqualified forthwith unconditionally. Signages will be placed on clearly and easily visible locations during the race. Riders shall be in position with their bicycles at the start line at least 15 minutes before the designated start time. 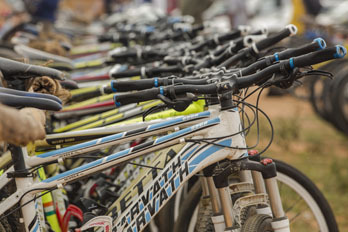 Bicycles used by each rider shall be subject to scrutiny by race organizers before the start and after the end of the race. 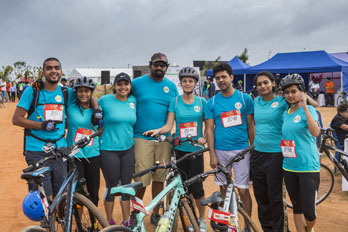 Race organizers shall have the right to detain any rider or any bicycle used in the race at any time and their decision in this regard shall be final and binding to all participants. 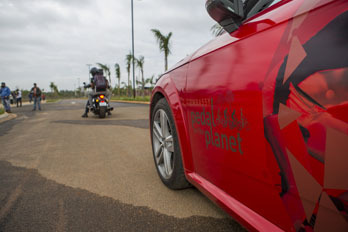 No private vehicles will be allowed on the race route at any time. The registration is non-transferable and the participant will be disqualified if otherwise. 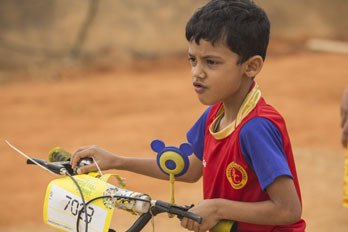 The rider must be in possession of the appropriate bib and relevant ID card at the start of all the races and retain the same in his/her possession till the end of the race. The organizers shall retain the first and last right of refusal/acceptance of the participation of any of the participants. No medical insurance will be provided to the participants. 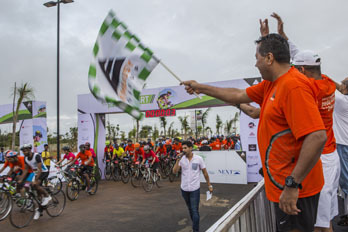 Any kind of cheating or any misbehavior with any of the participants during the cycling rounds, if noticed by the company or any of its affiliates, contractors or sponsors of the event, will lead to disqualification. 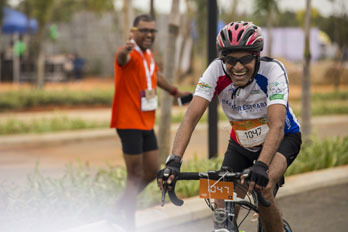 It is sincerely advised to obtain a medical clearance from a registered medical practitioner/doctor allowing you to participate in the event, irrespective of whatever may be your age and whichever race you may be participating in. 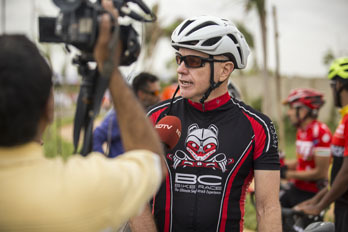 If you have answered YES to any of the above questions, we strongly recommend that you seek advice from your doctor before you ride the race. Please remember it is not advisable to ride if you have had any sort of virus or fever in the four weeks prior to race day. It is not advisable to run with an inquiry. Further, you must write the information as required on the back of your number bib with a permanent marker, viz. your name, person to contact in case of any emergency, your medical condition and any medications you may be allergic to. 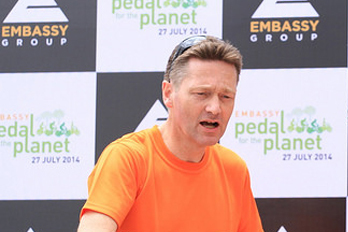 If there is a risk that you may blackout during the race (e.g. if you suffer from fits), please put a black cross on the front of your number. 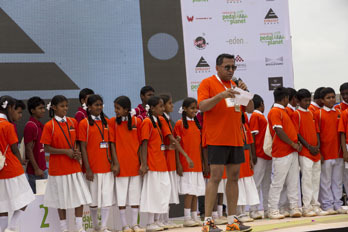 The organizers and sponsors/partners of the event will not be responsible for any injury, of whatsoever nature, that may be so caused, by your participation in the Race and the participants shall fully indemnify the company or any of its affiliates, contractors or sponsors of the event to the said effect. 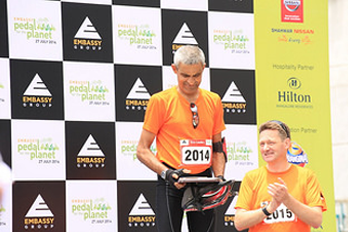 I myself voluntarily register for Pedal for the Planet 2018 (hereafter referred to as competition). 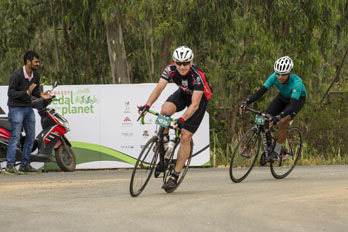 I understand comprehensively and agree with all regulations, rules, requirements and measures instituted by Pedal for the Planet event co-organizers (hereafter referred to as organizers). I am in good health condition in which I am fully prepared for the competition (consent letter from a doctor, on their letterhead, to be carried to the venue if the participant has a medical condition), and I am willing to accept the doping test required by the organizers, if necessary. 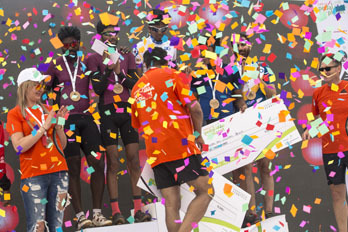 I understand comprehensively all potential risks in the competition, and have already prepared precautionary measures based on personal health; I am willing to undertake the full responsibility of all personal emergency risks which occur during the competition, and agree that the organizers do not undertake any compensations and responsibilities of injury, death, or any other forms of loss, which is caused by participants themselves. I agree to accept the first aid and emergent medical treatment provided by the organizers during the competition, and I shall pay the expenditures by myself in accordance with medical treatment incurred in hospital. I authorize the organizers and designated events media for free use of my portrait, name, voice and other personal information by the organization for promotion of the competition. I promise that I shall register for competition based on all my true individual information, and will not transfer my bib number to any others. I agree not to deliberately damage, change or mask my bib number before and during the competition. I agree to provide valid personal identity documents and information to organizers for personal status confirmation, and undertake full liabilities due to any false individual documents or information provided. I agree to submit to any searches for prohibited items including but not limited to weapons, alcohol, narcotics, controlled, dangerous and/ or illegal substances. I agree that the organizer may post pone, cancel, interrupt or stop the event due to adverse weather conditions, dangerous situations or any other causes beyond their reasonable control. I agree that the decision of the organizer pertaining to the routes, prizes and other event related decisions is final. I have fully understood this declaration. 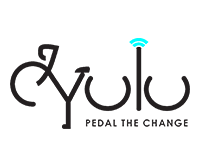 Once sale of Pedal for the Planet ticket is completed, no exchange of tickets will be made. No refunds will be made except pursuant to event postponement or cancellation and at Promoters discretion. Lost ticket/s will not be replaced or refunded. Entry will be refused if tickets have been found to be tampered, counterfeited, and/or not purchased from an authorized point of sale. The Promoter / Venue Owner reserve the right, without refund or compensation, to refuse admission/evict any person(s) whose conduct is disorderly or inappropriate. 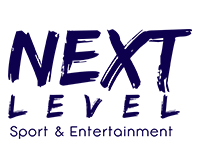 The Promoter/Venue Owner may use the ticket holder image or likeness in any live or recorded video display, picture, publicity material or website. 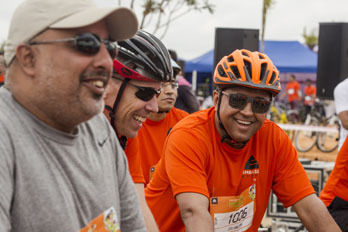 By entering the race you give permission for the free use of your name, voice or picture in any broadcast, telecast, advertising, promotion or other account of this event. 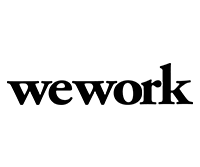 The Ticket Holder agrees to submit to any searches for prohibited items including but not limited to weapons, alcohol, narcotics, controlled, dangerous and illegal substances. The Ticket Holder voluntarily assumes all risks and danger incidental to the event whether occurring prior to, during or subsequent to the actual event, including any sickness, death, personal injury, loss, damage, or liability. Indian law shall govern the sale of all tickets and you agree to submit to the exclusive jurisdiction of the Bangalore courts. All entry fees, related tickets and purchases are non-refundable. No transfers between races or transfer of places to another runner. We do not operate a deferment system. Animals will not be permitted with the exception of guide dogs; arrangements for guide dogs must be made with the organisers ahead of the event. This is a prize money event. The organizers have the right to revise the prize money if the need arises. II. 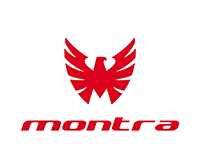 Bib shall be affixed to the front of the jersey / T-shirt in an unobstructed and clearly visible manner. Failure to do so may result in disqualification of the participant. Please bring payment receipt and your ID proof for collecting your bib. In case you are sending a representative, make sure to also send a signed authorization letter along with ID and payment receipt. There is a student discount of 20% available for students. 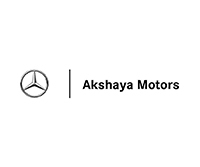 Use coupon code "STUDENT1" at the payment page to avail the discount. Students need to have a valid ID card inorder to avail the discount.